* This vegetable is the most perishable: kale. Leeks. These need washing. It was getting dark as we prepped them, and we did not realize how much soil was still on them. Refrigerate and eat within three weeks. Leeks are not a long-storage crop. You may need to strip off one or two outer leaves to freshen the leeks before you cook them. Potatoes, Carola and Red Maria – Can be stored at room temperature or in a cool spot, but must be kept in the dark so they do not turn green. The Carolas are think-skinned and prone to drying out, so keep an eye on them. A loose plastic bag over the paper bag might help, but do not close the plastic bag. Both types will store longer if kept cool. Around 40 – 50 F is ideal. These potatoes were grown by our friends/neighbors Peg and Matt Schaeffer. Red Marias are another favorite for the Schaeffers. They are good all-purpose red potatoes with moist, sweet white flesh, good for boiling, mashing, roasting, and salads. Stores well. Sweet potatoes – These are the Covington variety, and have developed excellent flavor and sweetness. Store at room temperature, no lower than 55 F. Keep them on your kitchen counter where it’s easy to keep an eye on them. I like to keep ours in a paper bag so they don’t dehydrate. Cook promptly if they start to soften. The roots come in a wide ranges of sizes and all are good. Butternut winter squash – You will receive three to six butternuts, depending on size. They are a mix of varieties: Metro, Waltham, JWS. Store winter squash in a cool, dry place. 50 F is ideal. Do not put in a plastic bag. Inspect your squash frequently and cook promptly if you see any soft spots developing. You can cook, mash and freeze the squash for future use. I find that you can refrigerate cut raw squash for up to one week. This runs counter to the accepted way to store squash, but is useful if you want to cook just half a squash at one time. Try microwaving your squash for one to two minutes before cutting or peeling. This softens the squash and makes large butternuts easier to handle. We are creatures of habit when it comes to Thanksgiving. Here are our plans so far: brined roast heritage turkey (Beth), Brussels sprouts with garlic-mustard vinaigrette (Steve), roasted sweet potatoes with garlicky yogurt dip (Sophie), glazed butternut squash (Beth), crunchy carrot-Beauty Heart salad with sesame-seed dressing (Steve), homemade applesauce (Ari), and apple pie (Sophie). We love celebrating Thanksgiving and the end of harvest season! There are many terrific Thanksgiving menus and recipes online right now. Many include vegetables that you will receive in this delivery. Here is a list of the recipe sites I rely on for new vegetable and salad recipes. Search any of these sites if you are stumped about what to do with your storage share. * The New York Times Cooking app keeps getting better and better. They post appealing recipes and recipe collections every day, and just posted a Thanksgiving menu planner. In my opinion, Melissa Clark is the best NYT food writer. She’s practical and her dishes are always flavorful. David Tanis, Mark Bittman and Martha Rose Shulman are other favorites. The app and recipes appear to be free to the public, but I think you need to be a NYT subscriber to save recipes. * Smitten Kitchen is our go-to site for dessert recipes but has excellent veggie recipes too. Plus the blogger is funny. She’s posted a string of interesting recipes this month. Once our work is over, I’m cooking my way through all of them. The calendar says “fall” but the weather says “summer.” I am sure you have noticed. Nonetheless, we are near the end of our CSA season. This week, November 5/6 = Final box for our purple EOW members. Thank you! Next week, November 12/13 = Final box for weekly members and for green EOW members. Storage share members – I sent you an email yesterday to confirm that you are registered, and with info about the delivery schedule. Kelcie and Billy harvest Brussels sprouts in shirt sleeves. That’s not shabby. Compare with our 2013 Brussels sprouts harvest. What a difference. We cut the stalks and took them back to the warm barn to pluck the sprouts from the stalks. It’s impossible to do outside when it’s that cold. Next week’s box will probably contain sweet potatoes, Brussels sprouts, leeks, winter squash, red cabbage, carrots, Beauty Heart radish and garlic. German butterball potatoes – These are from our friends Peg and Matt Schaefer of Sandhill Family Farms, and are the potatoes our crew helped harvest a few weeks ago. Matt says German Butterballs good all-around potatoes with outstanding flavor. This variety was the first place winner in Rodale’s Organic Gardening “Taste Off.” Best uses are roasted, boiled or fried. We boiled small ones in salt water and they were excellent. Everone in our house chose a different accompaniment for the potatoes; sriracha mayo (Ari), garlic mayonnaise (me), kimchi (Steve) and parmesan cheese (Sophie). Butternut squash (tan, cylindrical winter squash) – This “Metro” variety has cured very nicely, with good sweetness, flavor, and color. Storage share = two large boxes in November. 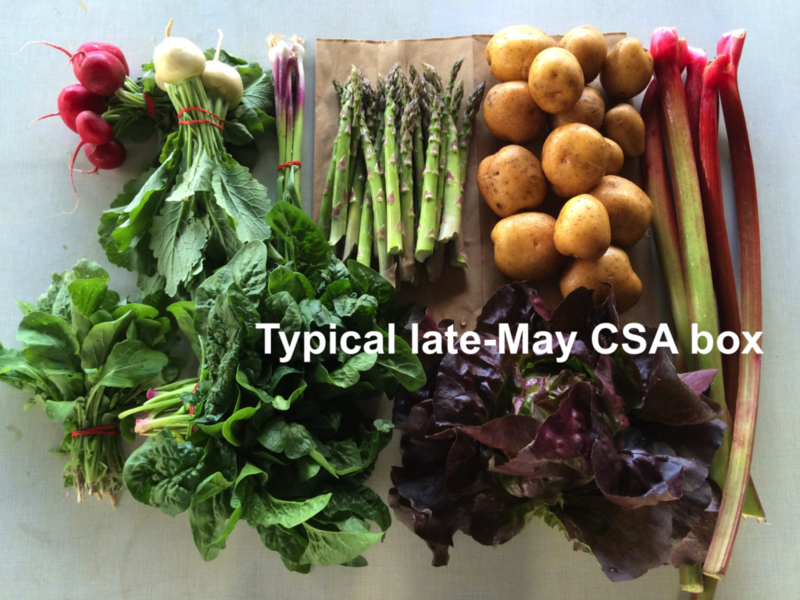 We still have a few storage shares available for hungry members who want to extend their CSA season. Our storage share consists of one delivery of two large boxes. Delivery date will be November 19/20, 2015 (Thurs/Fri sites). This is the last chance to sign up – we need to place our potato order soon. To register for a winter share, go to tipiproduce.csasignup.com/members/updatemembership and follow the instructions. Cost: The cost is $105. – The deadline to register is September 30, or when the shares sell out. – To hold your reserved storage share, we need your payment in hand one week after you register, and no later than Oct. 6. The produce: This delivery is much larger than deliveries during the CSA season, about 3 times the size of our typical CSA box, packed into two large boxes. The contents will depend on the weather, and what is available and good quality. Expected contents include potatoes, carrots and onions, plus stored crops such as winter squash, leeks, garlic, cabbage, beets, celeriac, parsnips, rutabagas and winter radishes. We will probably include something fresh from the garden, eg. Brussels sprouts, cauliflower, broccoli or greens. Some veggies will need to be refrigerated. Others can be stored at room temperature. Click to see what we delivered in the 2014 storage share. Not sure if you already ordered a winter share? Send yourself an email with your membership info at tipiproduce.csasignup.com/members/statusemail. Once the email arrives, look under Membership Details/ Member Type 1 to view whether you have already signed up for a winter share. Our crew gathered to march in the Willy Street Fair parade again this year, powered by Maggie and Jon’s energy. Actually, everyone was pretty enthusiastic. This year’s innovation? Maggie screen-printed sixty “Water On” Tipi t-shirts to give away. This is the special shirt she designed for our farm crew. That woman has so much energy. Jon constructed a catapult from a giant rubber band and a u-boat, a type of cart. That meant we didn’t just toss the t-shirts into the crowd, we launched them. Orange Orano peppers, grape tomatoes and flowers were our other offerings. Our friend Rob Summerbell of Jolly Giants Entertainment followed us in the parade, steering his enormous Wacky Wheeler. “Look at that,” he thought, “everyone is eating orange popsicles.” Nope, those were our orange peppers. Some people take them, some people don’t. I guess peppers and tomatoes are unexpected parade treats. Maggie made the banner last year. The handles are rims for canning jars! From back, Lizzy (with kale), Kelcie, Jory, Madeleine with Pickles in pouch. The bubble-mobile. We were honored to trail the parade’s biggest celebrity. Melon Man and Brassica Boy, armed with kale sabers. They made their capes from cauliflower leaves, the sturdiest leaves on the farm right now. See the noisemakers trailing Maggie’s rickshaw? More canning jar rims. Jon (carrying kale), Steve and Jeremy bring a u-boat loaded with peppers and tomatoes. The thick rubber band nearest the top is our t-shirt catapult. Our tallest fan enjoys a grape tomato. Maggie with her rickshaw. Someday soon, I will write about the crew’s efforts preserving produce for winter. They are heroic. We feel like such amateurs. Maybe for next year’s CSA boxes? Hey folks, I’d like to explain our extra produce sales, for the benefit of new members this year. You’ve probably noticed our emails offering extra tomatoes or peppers for sale. We offer these sales at peak season when we have more than enough for the CSA boxes. It’s a chance to preserve some tasty produce for winter. At this point, tomato sales are done for this season. We might offer red peppers again, but maybe not. Later this fall, we’ll offer boxes of green kale. Basil is unlikely this year due to a disease problem. The turn-around time to place an order is often short, sometimes just a few hours. We realize this can be difficult for members, but we cannot open sales until we’re confident we have what’s needed for the CSA boxes. That often means a short window to place your order. FYI, I usually make the announcements on Tuesday or Wednesday. A few sites will get one heirloom tomato per box. Next week’s box will probably contain carrots, beets, winter squash, edamame soybeans, peppers, onions and more. Red potatoes – Finally, we have potatoes for you. There has not been room in the CSA boxes until now! Chad Malek of Specialty Potatoes and Produce in Rosholt grew these organic potatoes for us. Italian beans – This is Steve’s favorite type of bean. Broad and sturdy, they can be lightly cooked or braised for a longer time. New York Times writer Melissa Clark’s article “Beans in Their Own Sweet Time” is a revelation about how to braise beans. 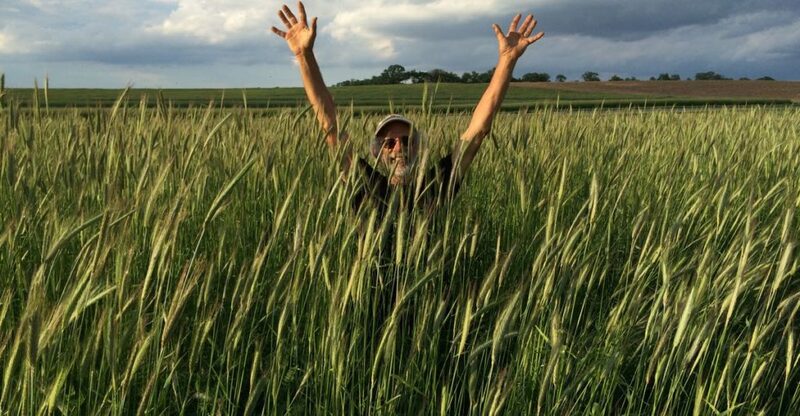 She writes “The beans I grew up on were barely blanched until green as grass, retaining a fresh, chlorophyll taste and a firm al dente texture that seemed to make sense with their spaghetti-thin girth…. But when the Italian mother of my college roommate offered a plate of tender beans, I found them addictive from the first melting bite. With a droopy texture I would have considered overcooked as a know-it-all kid, these gorgeous legumes were a revelation. Gently simmered in a rich garlic-flecked tomato sauce until soft and velvety but not the least bit mushy, I had seconds, then thirds, which tickled the cook to no end.” Basically, instead of a quick steaming, you braise the beans in a flavorful sauce until they are very tender and have taken up the sauce’s flavors. Melissa’s recipe calls for green beans, but I like braising Italian beans best. Slicing tomatoes (mixed colors) – We’re happy to still have tomatoes but recognize these will not store long. It’s best to refrigerate them. Better yet, eat them quickly!